Finland’s millionaire prime minister sought to reorganize the welfare state along the lines of a private business. But his hard-line policies and failed assault on health care have revitalized the Finnish left. It all seemed so promising back in 2015, when the “three S’s” — Juha Sipilä, Timo Soini, and Alexander Stubb — announced their new government. The dapper Europhile Stubb, leader of Finland’s traditional conservative party, enthused that the forces joining in coalition seemed almost to have merged. He, and the whole Finnish center-right, thought this would be the government that would finally reform the social and health care system and achieve capital’s long-standing aim of forcing labor to heel. For Soini’s right-wing populist party, named simply “the Finns,” this was going to be the government that would take a hard line on immigration. The parliamentary election on April 14 will offer Finns a chance to pass their verdict on Sipilä’s record over the last year. But with his party slumping in the polls, and center-left forces in the ascendant, the vote looks set to mark a humiliating end for efforts to impose “business values” on Finnish welfare. The right-wing government has its roots in the confused “rainbow” coalition which emerged from the 2011 election. After the breakthrough by the Finns Party in that contest, a six-party government was formed spanning the rest of the political spectrum, from National Coalition on the right to the post-Communist left Alliance. While Finland has a history of coalition administrations, this one was particularly fractious, especially under the pressure of economic crisis and rising right-wing populism. The rainbow coalition’s failings especially concretized in its final stretch, as the Left Alliance and Greens left the government, leaving the Social Democrats and National Coalition to veto each other’s reform projects in panic. But if these forces as well as the Center Party, then in opposition, seemed to be in crisis, the debate was soon short-circuited. In 2012, Sipilä, a millionaire businessman who had only become a MP a year earlier, came from almost nowhere to muscle out his rivals for the Center Party leadership. Paying the scandal-hit party’s considerable debts out of his own pocket, he promised to commit his business acumen to saving Finland itself. 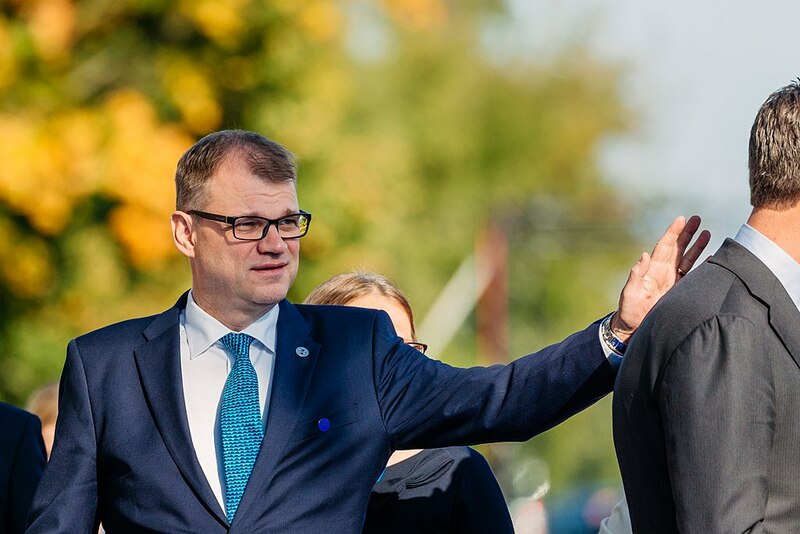 Sipilä’s ascent was aided by media, who found the image of a businessman savior irresistible. After all, here was a man who could simultaneously be portrayed as offering vague, unspecific change to the chaos of the rainbow government, while also leading one of Finland’s most milquetoast parties — someone who wouldn’t rock the boat too much. The media onslaught was successful — Sipilä won the 2015 election handily, with 21.1 percent of votes, a large (though not historically high) figure in Finland’s multiparty order. Arriving in office in 2015, Sipilä inherited a lost decade in the economy. The great crisis of 2008 did not, at first, hit Finland hard, but its tail was long and drawn-out. For Sipilä, the answer was clear: the country was not working, and to get working, it would need to be run like a business — or indeed, by a businessman. One of the first major episodes in the new government, in autumn 2015, saw a clash with Finland’s formidable labor movement. Sipilä’s original plan was to include the Social Democrats in the government precisely to avoid this clash, with an understanding that this party could get the unions to swallow anti-labor policies. However, the Social Democratic leader Antti Rinne, himself an old union leader, was understandably reticent about this prospect and angry about his party’s lowest electoral result ever, only 16.5 percent. He set conditions for government participation that Sipilä could not accept. Confrontation soon followed. The government’s major plan for labor was the so-called “social contract” — taking the country’s long tradition of Nordic corporatism, or trilateral negotiations between the government and employee and employer unions, and using it to make the unions accept effective wage cuts by pushing up working hours. When the unions refused to follow Sipilä’s command, the government threatened to pass a law to force them to do so. A long media campaign over what unions dubbed a “force-law” culminated in a major demonstration bringing 30,000 union activists to Helsinki, as well as a six-hour national strike. In the end, however, the unions agreed to an altered version of the competitiveness pact, in order to preserve the Nordic corporatist model. Sipilä and Stubb celebrated their victory with fist bumps. The proposal was renamed a “competitiveness pact” and the rise in working hours fell from thirty minutes per day to thirty minutes per week. But many of the labor rank and file still felt betrayed. The unemployed felt the brunt of another major reform, the so-called “activation model,” which considerably increased means-testing in the social security system. This clashed with the government’s famed Universal Basic Income (UBI) experiment, which was supposed to put an end to all means-testing. The experiment, supposed to find out how UBI would affect employment, was moreover rigged against itself by its choice of test subjects, as it was based on the long-term unemployed, who would in any case have had a hard time finding work. It did find that the quality of life did improve for the test subjects, though tellingly of the current state of public debate in Finland this indicator alone was not considered of particular value. The government’s first budget also included countless other cuts, such as freezing the index for social security payments, thus allowing inflation to eat away at the benefits of the unemployed, as well as limiting the right to day care. Most controversially, though, the Centre and National Coalition made vast cuts particularly to secondary education, going against their explicit “education promises,” signed in 2015, to maintain spending. University budgets were also slashed; the government promised that the relaxation of rules on private funding for universities would cover for this, albeit at the cost of allowing yet further business influence on the academic agenda. As a whole, Sipilä’s agenda was yet another step in the neoliberalization of Finland’s welfare state. Its wage freezes and spending cuts were focused on improving Finland’s capitalist competitiveness, and employment has indeed risen. But the simultaneous neglect of the education sector — the basis of the strength of Finland’s high-tech economy over recent decade — sets the country along a path where further competitiveness efforts will require an increasing race to the bottom. Yet even more important to Sipilä’s agenda was reforming health and social care. And this is where he came unstuck. Finland’s health care system is built on a simple basis. Finland’s local areas, or municipalities, provide health centers offering comprehensive basic care. The more extensive functions were first provided by counties, which essentially operated as regionalized central government authorities, and then by intermunicipal health care districts. When this was connected to policies that ensured that even rural areas remained full of young people and well-paid jobs, this was quite a success. However, by the 1990s, this system had started acting up. The countryside was growing emptier and older, and increasing lifespans also meant that people spent a rising proportion of their lives in an infirm condition and out of work. There is a general consensus on the need to reform Finland’s social and health care system, but less so as to the means of doing so. Indeed, the ruling parties’ different priorities prompted a governmental crisis in late 2015. Sipilä’s Center Party was suspicious of the National Coalition’s focus on “freedom of choice” — a bid to increase private providers’ power to seek private profits using public funds — while the National Coalition was reticent about the Center’s plans for stronger regional administration, which they saw as a way of cementing the Center’s power over rural Finland. At the eleventh hour, Sipilä saved his government by promising to fast-track the implementation of “freedom of choice” in exchange for National Coalition accepting the regions. It was this decision, however, which proved fatal for the plan, as the new model could not pass constitutional review. The Finnish constitution guarantees everyone a certain level of services, no matter their income or where they live. It was already doubtful that the “freedom of choice” model could be combined with this, but the problems of private health care were concretized in late January 2019, due to the actions of a health sector union whistleblower. It turned out that Esperi Care, one of the main operators in the field of private senior care services, had been running senior citizen’s homes that had countless cases of elderly people being neglected to the point of abuse and employees made to work to the point of exhaustion. The CEO resigned, but the damage had been done — not only to Esperi Care, but also to the reputation of private health care in general. Soon, politicians across the political spectrum were clamoring to pass a reform that would raise the number of nurses to 0.7 per patient in the senior citizens’ homes. Other parties were ready to pass this proposal right away, but the National Coalition attempted to dance around the question and propose various alternatives. Many drew a connection between this reluctance and the way National Coalition politicians seem to constantly pass through the revolving door between politics and business to take lucrative jobs in private health care and senior care companies. National Coalition had other problems, too. Increasingly, it started looking more and more likely that when the reform came to a vote, some of its MPs would defy the whip and vote against. These MPs generally came from the party’s hard-right and libertarian wings, and thus didn’t find the reform too market-based, as the left-wing opposition did, but rather not market-based enough. They received support from Jan Vapaavuori, the mayor of Helsinki — also a member of National Coalition — who crusaded against the reform on the basis that it would transfer power from his city to Uusimaa, the larger region surrounding it. The libertarians were right in one sense: the talk about the freedom of markets was in fact used to create opportunities to funnel public money into private profits. “Freedom of choice” basically meant the government using the same funds it now uses for public services into purchasing outsourced services. Meanwhile, the experts predict that the use of private services means that the reform supposed to cut health care costs by 3 billion euros would actually be costlier than a more public-based model. In the end, the Center was increasingly left as the sole defender of the compromise. Its MPs maintained the facade that the plan was about to pass, but their supporters were increasingly deserting a party they saw as betraying rural areas. Not only was the Center abandoning small municipalities to the mercies of health care privatization, but it was also liberalizing the taxi business, thus raising costs in many sparsely inhabited regions where senior citizens need taxis to access services. Sipilä’s dramatic announcement on March 8, 2019 that the reform had failed and the government was resigning was thus probably just recognizing the inevitable — a few hours before the National Coalition would have scuttled the reform anyway. Back in 2015 the Center and National Coalition had also been joined in government by “the Finns,” a right-wing populist party. It was them who bore the brunt of the labor reform, as Jari Lindström, the Labor Minister, an old shop steward who came from the working class, now had to advocate for a hard line against the unions. The party dipped in polls as its working-class supporters deserted it, and its troubles deepened when Syrian and Iraqi refugees started entering Europe en masse in 2015 and Finland found itself with 36,000 asylum seekers coming over the border. Timo Soini, leader of the Finns and Foreign Minister in the government, could do little but offer platitudes. Even so, arriving at the party convention in 2017 he was confident that everything would go according to his script, including in appointing his planned successor Sampo Terho. Instead, Terho was swamped by votes for the informal leader of the party’s far-right faction, anti-immigration blogger-politician Jussi Halla-aho. Overnight, Soini and his allies wrote up plans for an impromptu party coup, which then transformed into plans for a new party altogether. Soon, Prime Minister Sipilä announced that he and Petteri Orpo, Stubb’s successor as National Coalition leader, did not share Jussi Halla-aho’s values and that the Finns could not continue in government. Shortly thereafter half of its MPs announced they were forming a new group that would continue in the government, allowing it to postpone its collapse. This group, led by Terho, then formed a new party called Blue Reform, a populist party without the people based on a set of technocrats without expertise. It is currently polling just 1–2 percent and will win few MPs. At first, the party who most reaped the benefits of the Finns’ betrayal of labor were the Social Democrats, the traditional party of the unions. However, infighting between the labor wing of the party and liberal-centrists like former leader Jutta Urpilainen opened space for a media onslaught against the Social Democrats. This also opened up room for the Greens, who had long since left behind their activist origins to present themselves as a sleek urban-liberal vehicle, a so-called center-left for the twenty-first century, appealing to a young and fashionable constituency. However, the Greens found it harder than they expected to establish themselves as a major party. After their popular leader Ville Niinistö had to bow out due to term limits, his follower, Touko Aalto, was embroiled in a media storm due to a messy divorce. After the party dipped in polls, Aalto resigned, and the Greens replaced him with Pekka Haavisto, a seasoned politician who has brought the party back to 12–13 percent. This would mark a historic high. Yet it is notable that the Greens have not been able to fully utilize the wave of climate activism that hit Finland starting from the exceptionally hot summer of 2018. While youth march in the streets and participate school strikes, the electoral campaign seems concentrated on scaremongering over environmentalists coming to take away ordinary citizens’ cars and their meat. Having failed in government, the National Coalition, currently polling 16–18 percent and the Center, currently polling 14–15 percent, are today seeking to revive their flagging support by attacks on the “red-greens.” However, the party that has reaped the rewards of this rhetoric is the one these parties kicked out of the government. The Finns party has long attacked environmentalism, not outright denying climate change but constantly challenging all practical measures proposed to fight it, save from nuclear power, as utopian and harmful to regular Finns. Likewise, the measures to tighten immigration have failed to benefit the ruling parties. Instead, a series grooming cases and other sexual assaults in the town of Oulu have fueled Halla-aho’s anti-immigration crusade, and his party particularly exploited Sipilä’s promise to open his own house to a family of refugees in 2015 to suggest the prime minister is responsible for every asylum seeker arriving in Finland. Not only is the party now gaining in polls but also radicalizing, as its youth organization contains figures who invite the likes of Ukrainian Azov Battalion’s spokeswoman Olena Semenyaka and antisemitic writer Kevin McDonald to Finland. The party’s commercials portray the anger of Finns over immigration and corruption forming a monster that attacks kleptocratic politicians. There are also more positive signs. Left Alliance, established in 1990 by a number of preexisting socialist and communist forces including the once-mighty Communist Party of Finland, has counterposed itself as an alternative to both the neoliberal policies of the Finnish center-right and the far-right populism of the Finns party. Helmed by a charismatic, well-liked party leader, Li Andersson, the party’s polling has grown slowly but steadily from 7 percent to nearly 10 percent and the party is ready for entrance into a new government, perhaps led by the Social Democrats (currently polling at 20–21 percent) and including the Greens. What these years have concretized to Left Alliance, and to Finnish left in general, is that a change is needed. A new government could build a social and health care model from the point of view of the people instead of private profiteers, advance the rights of the workers, commit to courageous climate targets while preserving a social agenda that ensures the burden of meeting those targets is not placed on the backs of the poorest, the workers, and those living in remote regions, and preserve human rights from the right-wing populist onslaught. Nevertheless, even such a government would face many problems on the way. The energy of the labor and climate movements must be maintained, even without a right-wing government to serve as an easy target. Tatu Ahponen lives in Tampere, Finland. He is a member of the Left Alliance and a deputy member of the party council. Where Next for Finland’s Welfare State?